Charles Schwab Global Account is another option to trade foreign stocks in 12 countries with their local currencies. There's no minimum to open a Schwab Global Account and there's no minimum to trade. The account also has no service fee. From now until March 31, 2013, commissions will be waived regardless the number of shares, but currency conversion fee may apply. Back in 2007 when the China’s stock market was red hot (Shanghai Composite Index peaked in October 2008 and since then lost nearly two-third of its value), I got myself an E*Trade Global Trading Account and bought two stocks that were traded in Hong Kong using the account. Though there are plenty of Chinese ADRs traded on the U.S. exchanges, the two I bought at that time, ICBC and Alibaba.com, were not available for direct purchase unless through services such as the E*Trade Global Trading, which allows individual investors to invest in foreign stocks with local currencies (Hong Kong dollar in my case). Nearly five years later, I still hold those shares I purchased, though they didn’t do much for me over the time: Alibaba.com was taken private and ICBC barely making any money for me after all the fees. Though I probably will hold on with my shares for as long as I can see since selling them and convert the money back to U.S. dollar will be costly, I have no plan to buy any more share any time soon. However, if I do, then I may explore another option that I came to know recently: Schwab Global Account. To me, the Schwab Global Account looks a lot similar to the E*Trade Global Trading Account, but with more countries to choose from and lower commissions than what E*Trade charges. With the Schwab Global Account, you will be able to trade stocks listed in 12 countries with their local currencies, including Japan, Canada, France, Germany, Hong Kong, United Kingdom, which are also available at E*Trade, Australia, Belgium, Italy, Netherlands, Norway, and Finland, which are only available at Schwab. As you can see, the foreign markets offered by both E*Trade and Schwab are all the developed economies, with heavy concentration in the European markets (8 out of the total 12). However, given the debt crisis in the Europe, it may not be a good time to step in now despite the many choices. As for trade costs, the two are also quite different in the amount of fees charged in online trade. Since both of them offer options to make stock trade in local currencies, an online trade usually involves two kinds of fees: the currency conversion fee between U.S. dollar and the local currency and trade commission. At Schwab, the currency conversion fee is based on the amount of money to be converted into the local currency. If it is $100,000 or less, Schwab charges 1% for the total amount exchanged; for $1M and more, the ratio is reduced to 0.20%. E*Trade doesn’t have a table showing exactly how much each currency exchange will cost, but from what I heard, the fee could be between $10 and $20 (I hate it when they don’t spell out the exact cost). Stock trade commissions, which are different from country to country, are also lower at Schwab in general. For example, if I trade stocks listed on Hong Kong exchange, I will pay E*Trade nearly HK$300, but only HK$250 to Schwab. 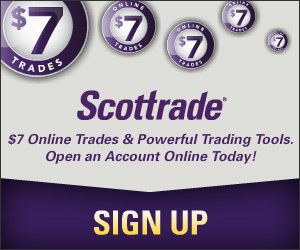 The cost of making one trade of stocks listed in Japan will be ¥3,400 at E*Trade, but only ¥2,000 at Schwab. While it is quite expensive to trade foreign stocks in their local currencies, whether with Schwab or E*Trade, commissions are waived at Schwab until March 31, 2013 when using the service to buy foreign stocks that are currently not available in this country. Through the end of March 2013, investors can trade stocks commission free with the Schwab Global Account, though the currency conversion fee still applies. I mentioned above that right now may not be a good time to invest in Europe due to its debt problem and that no short-term solution is on the table to fix the problem despite numerous summits. The opposite could also be argued that maybe the time is right for those stocks that were depressed by the crisis, but still have strong fundamentals. There’s no minimum to open a Schwab Global Account and no service fee. However, the Global Account, for now at least, can only be opened by filling out a paper application form or call Schwab.